Our oldest daughter was studying Mount Rushmore last year so when planning a trip to Wisconsin it seemed like a no brainer to stop in South Dakota. Long before leaving, a little research seemed in order. Why? Well, I hadn’t been there since the early seventies and this time I was going there to shoot photos; this was probably going to be a one time thing so I wanted to get it right. Our girls would love Mount Rushmore no matter what but I needed to get educated on how to shoot this famous landmark. I wanted my girls to have the time of their life and still get some photos. During this process, I learned two important points after literally reading many posts from a photoprapher’s perspective. Some people actually felt it was a let down, many thought it was good but not worth a specific photo trip, and a others really enjoyed it. However, most were in agreement that the morning sun was best time to shoot because the it rises on the faces. The second, after looking at all the photos that went along with the articles, most had the same postcard type captures of Rushmore which meant mine needed to be different. There had to be more than this one shot… Then I remembered some recent advice from someone I would consider a Jedi Master of photography; he said I always need to ask myself, “what am I not seeing here?” I literally need to ask myself this question because it’s not built in automatically. When I force this question upon myself and look at the subject, sometimes an aspect out of the nothingness will get my attention, somthing that was seemingly not there before. With Jedi Master EM’s advice in my ears, I looked at everyone elses photos of Mount Rushmore and pondered, “what am I not seeing here?” First, most of the photos were shot from the edge of the Grand View Terrace, so I needed to shoot from other places if possible. These locations needed to be nearby and still offer a great view or shoot from the Grand View Terrace and actually include it as part of the subject. Second, those who tried to do close up shots of the individual presidents didn’t have long enough lenses. Problemo solved, I’d bring my Tamron SP 150-600MM F/5-6.3 Di VC USD so I’d be sure to get in close (see the photo, Abe, at the top of this blog). If I hadn’t researched, this lens would have stayed home because it’s huge and doesn’t go out unless there is a reason… Third, I noticed that most people just showed up and hoped to get a decent shot. My response to this, not be in a hurry and arrive in the afternoon and stay the night. This way I could shoot when we arrived, come back in the evening for night shots, then get some sleep and come back in the morning before leaving on the rest of the trip. Lastly, in most photos, there were no people so capturing tourists gazing at the famous sculpture was a priority. The photo at right, Rush at Night, was an attempt to capture both Rushmore at night as well as people viewing it. The plan of making Rushmore an overnighter in the Black Hills town of Keystone, SD worked out pretty well. Not only was the weather a bit cloudy before sunset, I was able to capture night shots and the morning sun as well. Once you pay for parking, your ticket is good for a year so you’re not out any extra cash by seeing Rushmore three times in two days as we did. In fact, we paid our $11 to initially enter and park, then left the park to check in to our hotel and get dinner. Later, we returned in the evening and came back the following morning; all at no extra charge. You only need to pay for a hotel room in Keystone, SD but you’ve got to sleep somewhere right? Why not Keystone? Just come back in the morning when Mount Rushmore opens at 7am and there are very few people. The photo at left, Rushmore Clouds, was taken as clouds were approaching just before sunset. Personally, what made this trip unique was not simply showing up to see Mount Rushmore and check it off the list, but actually spending a little time there and discovering the different lighting! All photos were taken with the Canon EOS 6D using the Canon EF 24-105mm f/4 L IS USM lens including those below; Flags (L) & SD-244(R). 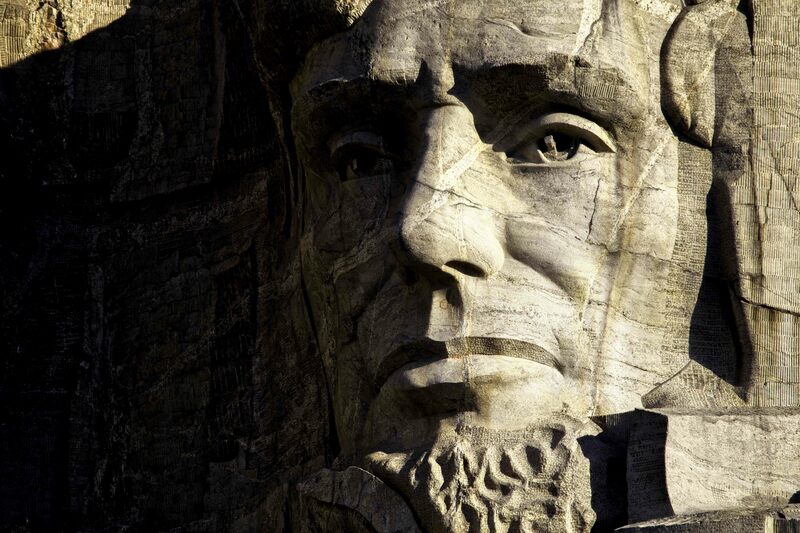 However, Abe, at the top was shot with the Tamron SP 150-600MM F/5-6.3 Di VC USD. Planning ahead and dedicating time to Mount Rushmore worked out for us; I got my photos and our girls got memories that will last a lifetime. Honestly, we would have spent the night near Keystone, SD anyway and left about the same time in the morning; so the Mount Rushmore stop in no way negatively impacted our timeline. It’s now been two months since our vacation and the kids are still talking about it, they even want to return. If you can, attend the lighting ceremony, you won’t regret that either. All in all, the research beforehand was well worth the time, listening to the Jedi Master also paid off, and planning to do more than check off the “we saw it” block for our summer vacation ended up being the highlight of our visit to South Dakota. South Dakota highway 244 passing by Mount Rushmore National Memorial.